A still from the Vugar Gashimov Memorial promo video. 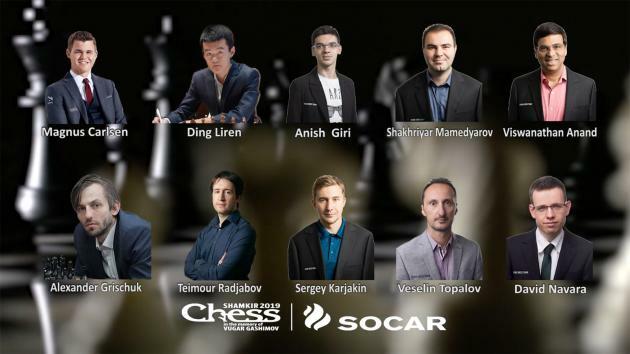 The Gashimov Memorial starts this Sunday in Shamkir, Azerbaijan. Magnus Carlsen, Ding Liren and Anish Giri are the top seeds in what will be a very strong sixth edition. It was in January 2014 when one of Azerbaijan's most talented grandmasters, Vugar Gashimov, died of complications from a brain tumor at the age of 27. The annual tournament in his honor will be held for the sixth time, and it's going to be wonderfully strong. The field is actually rather similar to last year, when Radoslaw Wojtaszek and Rauf Mamedov played instead of Anand and Grischuk. It only got stronger! Magnus Carlsen (28) is obviously the man to beat, and not just because he is the world champion and world number-one player. He also won all three editions that he played, in 2014, 2015 and 2018. It would be most welcome for Anish Giri (24) to grab victory in this major tournament, especially after his Twitter exchange with Carlsen earlier this week. Carlsen and Giri played their last classical game against each other, in the last round of the Tata Steel Chess tournament. After this game ended in a draw, Carlsen once again finished on top in Wijk aan Zee. Anish Giri traveled to Azerbaijan early. Besides Caruana (absent in Shamkir), in between Carlsen and Giri in the world rankings is world number-three Ding Liren (26). The Chinese grandmaster's last classical event was the World Teams, where he put put down a solid performance with six draws and two wins. Like Giri, Ding also played in the PRO Chess League in February. His team, the Chengdu Pandas, has now qualified for the San Francisco finals. It would be amazing if Ding could make it and play there. Another PCL regular is Shakhriyar Mamedyarov (33), whose team, the San Jose Hackers, played in the Pacific division and just missed out on this year's playoffs. The last classical chess for Azerbaijan's number-one grandmaster were three Bundesliga games early March for SC Viernheim: two draws and a win. Vishy Anand (49) also played three Bundesliga games in the same weekend in Berlin (1.5/3), after Wijk aan Zee. The Indian legend, who will turn 50 in December, will be the oldest participant in Shamkir. Besides his enormous talent, his undiminished love for the game and great work ethic keeps him among the world's elite. Anand has one other player of his generation. Unlike his old nemesis, Veselin Topalov (43) has not announced his retirement just yet but it almost comes down to the same thing. He did play several rapid events in St. Louis (and one semi-rapid in Salamanca), but the Bulgarian's last classical event was a four-game match with Ding in August where his 1-3 loss helped his opponent break 2800 for the first time. Before that, it was Shamkir 2018, and the one before was Shamkir 2017. Veselin Topalov in June 2017 in Paris. | Photo: Maria Emelianova/Chess.com. Teimour Radjabov (32) isn't very active anymore either, but still plays a little more classical chess than Topalov. Since last year's Gashimov Memorial he played the Batumi Olympiad and Wijk aan Zee, where he finished on 50 percent with 11 draws, a win and a loss. Alexander Grischuk (35) actually had a few months between his last two classical events, the Chess.com Isle of Man tournament in October and the World Team Championship this month in Astana. There, the Russian GM drew five games and won three, which was according to his 2771 rating. Speaking of which, we're actually seeing an interesting fight for highest-rated Russian player these days. Ian Nepomniachtchi is currently the top Russian player in the live ratings, as world number-seven. Grischuk has just 2.5 rating points fewer, and below them we see the retired Kramnik and the "Chuck Norris of Russia" (in Grischuk's words), Vladislav Artemiev, who had already virtually surpassed Kramnik after round eight of the European Championship. Still rated 2782 in June last year (with a peak of 2788 in July 2011), Sergey Karjakin (28) has lost 39.2 Elo points in the last nine months. His only classical event in 2019 was the World Teams, where he scored a disappointing 3/9. The lowest-rated player is in fact one of the most active. David Navara, who turned 34 yesterday, played 24 classical games in 2019 so far, in the Czech League, Gibraltar, the Bundesliga and the Prague Masters. There, on home soil, he scored minus one. Last year he scored 2.5/9 in Shamkir without a win, so his ambition must be clear. The stylish playing hall in Shamkir. | Photo: official site. This year's Gashimov Memorial once again has a prize fund of 100,000 euros ($112,266) with a first prize of 30,000 euros ($33,678). The venue is the Heydar Aliyev Centre in Shamkir, Azerbaijan. The playing days are March 31-April 9 with a rest day on April 5. The games start at 3 p.m. local time (last round 2 p.m.), which is 1 p.m. Central Europe, noon London, 7 a.m. New York, and 4 a.m. Pacific. The time control is two hours for the first 40 moves, then one hour for the next 20 moves and then 15 minutes to finish the game with a 30-second increment from move 61 onwards. No draw agreements by the players are allowed before move 41.